Chelsea captain John Terry must get used to no longer being a key figure on the pitch under manager Jose Mourinho, says BBC football pundit John Hartson. 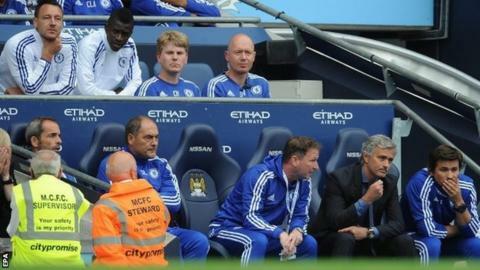 Terry, 34, was substituted by Mourinho at half-time in Chelsea's 3-0 defeat at Manchester City last Sunday. "It is likely that Jose feels John's age is starting to catch up with him and he won't play the same major role in the future," Hartson told BBC Sport. "He can't give Chelsea what he gave them two or three years ago." Mourinho's decision to take Terry off - the first time he has substituted him in 176 games - has been interpreted as a statement to Chelsea owner Roman Abramovich about the need to strengthen their squad. But former Wales striker Hartson claims Terry's substitution is "not a smokescreen for anything else" and merely a reflection of the stage the former England captain is at in his career. "Surely if Mourinho wanted more players he could just sit down privately and talk to the chairman about it," Hartson added. "I think John still has a lot to offer Chelsea but I don't agree with the pundits who said Jose was trying to make a statement about his squad needing strengthening by taking him off." Hartson believes that Valencia and Argentina defender Nicolas Otamendi, 27, would be a good signing for Manchester City if the deal is completed. "Manchester City have two players for every position. They look at it and seem pretty determined to win the title back," 40-year-old Hartson said. "Otamendi is a good player. City already have Vincent Kompany, Martin Demichelis and Eliaquim Mangala, so they are just making sure they have the depth." Is Van Gaal hinting at Pedro deal? Barcelona forward Pedro has been linked with a move to Manchester United and Hartson claims the 28-year-old would prove to be a hit. "United boss Louis van Gaal has been banging on about needing pace, and Pedro has that," said the former Celtic striker. "I still think they have a few problems defensively but he can have a big impact offensively. "Van Gaal has said he has three years to win trophies and that is what he is focussed on, no matter how much money it takes." Why do football transfers drag on? Hartson, who began his career at Luton Town and also had spells at Arsenal, West Ham, Wimbledon, Coventry, West Brom and Norwich says transfers are "a complicated business" which is why they can become drawn out. "You can have an issue over the structure of a sell-on clause, or the agent's fees. They are the unseen bits of a transfer but can take a lot of time to sort out," he said. "Everything has to be right for both clubs and the player and if something isn't, the haggling can go on forever, and often none of it is to do with the actual price. "Then you may have a position where a club does not want to sell - and has no intention of doing so - but as the talk drags on the player's head gets turned and it reaches a position where he is no longer the same player." Will Benteke give Reds 'X-factor'? Read more on Christian Benteke: Will Belgium striker give Liverpool 'X-factor'?